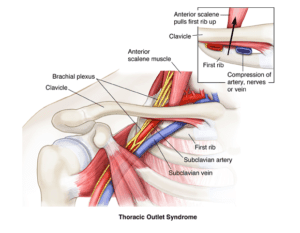 Thoracic Outlet Syndrome - Mississauga Chiropractor and Physiotherapy Clinic - FREE Consult! The patient often complains of a tingling sensation or numbness in the upper arm and shoulder, or pain radiating down into the hand. The most common type of pain travels down the inside of the arm. A physical exam will look for signs such as muscle weakness indicated by decreased grip strength, or tenderness in the shoulder-neck area. 85% of patients will show improvement in their condition with appropriate multidisciplinary conservative treatments.